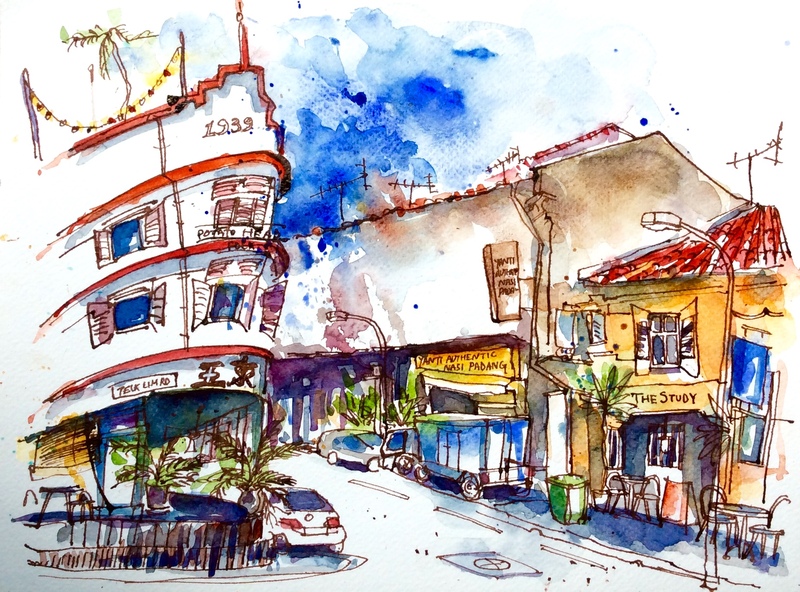 Couple of days back, on a late afternoon I was in Kampong Glam scanning streets, alleys, sidewalks, cul de sacs in search of a proper place to sit and sketch from. And as I was squirming in the intense heat, politely turning down offers to peruse Persian carpets on sale or to sit down for a Turkish dinner that could be had as the busboys promised with a view of the radiant Sultan mosque overlooking the entire Arab quarter, I realised that the ‘perfect location’ can be as elusive as anything good we pursue in life. Like the perfect job, perfect partner, perfect wine or the perfect vacation, if finding the perfect location needed to be worked for and sweated over, I was doing just the same but without any success in sight. Kampong Glam cafe that normally offers an unobstructed view of the palm fringed Bussorah Street had two black vans parked right under its nose and Haji Lane packed with tourists and Friday night revellers had zero real estate to spare. My patience was fraying. Just as I was harrumphing about the lack of a single spot of shade on Baghdad Street for me to crouch under and sketch, I wondered if ‘perfection’ is subjective and therefore if it is possible to calibrate our sense of perfection and still feel accomplished? I wanted to try. And by that I mean, despite being occasionally interrupted and accidentally elbowed by passersby crossing the narrow ‘five foot way’ right behind me did I consider the Working Title cafe on Arab Street the perfect location? Heck, yeah! 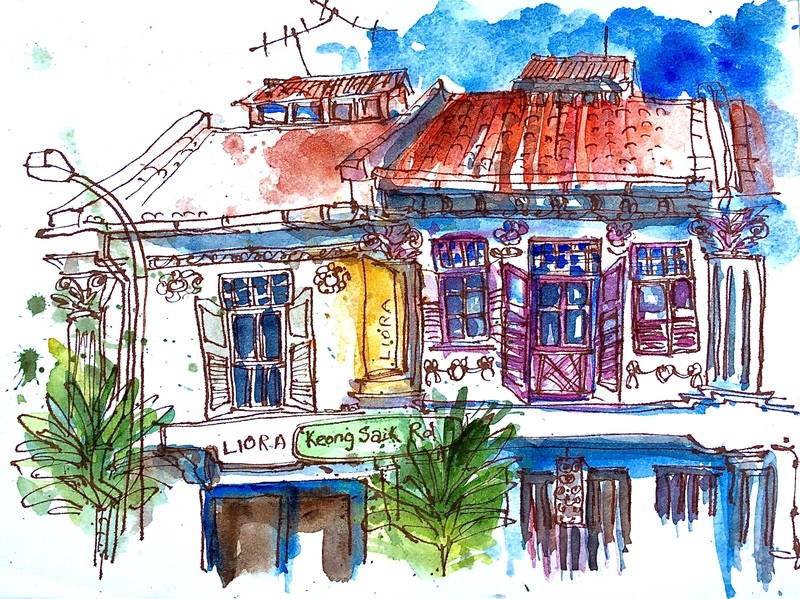 I sat by a big wooden table on the foyer all by myself for the next hour sipping coffee, looking across the road and sketching this row of beautiful shophouses. 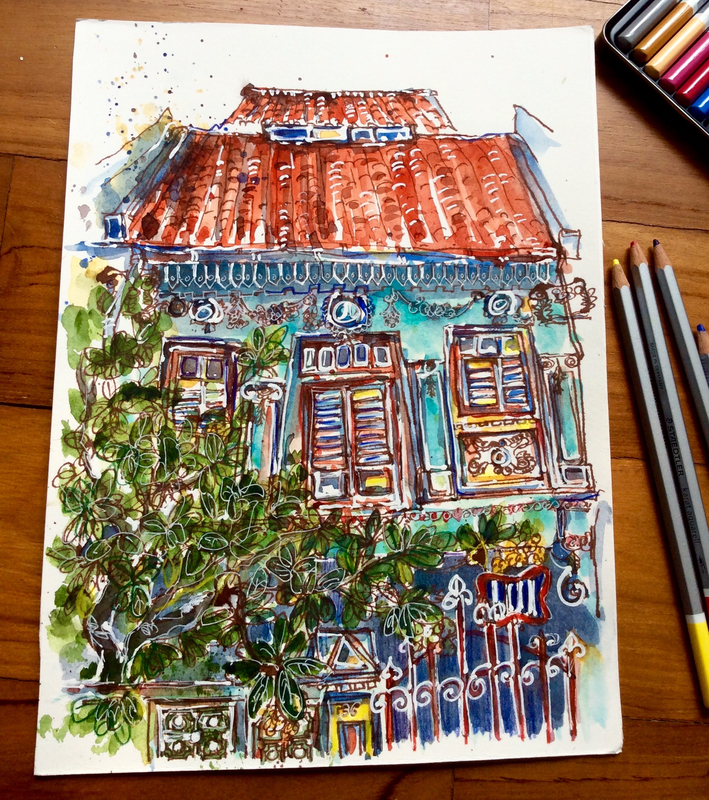 This entry was posted in Daily Vignettes, Shophouses and tagged Arab quarter, Arab Street, Baghdad Street, Bussorah Street, drawing, illustration, Kampong Glam, perfection, Persian Carpets, Shophouses, Singapore, sketching, Sultan mosque, Tabbouleh, urban sketching, Working Title Cafe on September 23, 2016 by Somali Roy. A sure shot way to fire up the creative engine is to just throw myself at Chinatown. It works every time, irrespective of how deep a rut I’m in. This neighbourhood with its rows of beautifully conserved shophouses in varied architectural styles is an incessant source of delight and creative inspiration. When you watch the encroaching high rises craning their neck from above, you realise that this wonderful anachronism is the result of deliberate choices made in its favour. Sure the rumble of tourists’ feet wandering these streets sound like ka-ching to the exchequer, but for people like me – this is where we come to chase our muse. I don’t know how the food fares at this eatery, but this building is an eye candy. I was only wondering, what if a Chinese fortuneteller had told Dr. Montgomerie who owned the 13 hectare nutmeg plantation around Craig Road in the 19th century, that one day, Spaghettini with caviar and chives will be rolled out from an exquisitely designed shop house standing at his property? Would he believe the soothsayer? The kind surgeon probably would’ve accused him of hyperbole. Walking further down Craig Road, Tong Mern Sern Antiques Arts and Crafts Shop with its cheeky signage enticed me enough to make a stop. My friends had exactly ten minutes to spare till lunch, so I had to make my fingers work crazy fast on the sketchbook, leaving me no time to cross the little road, go inside the shop and ask the owner about their tag line, so it doesn’t haunt me till death. I still don’t sleep okay. With a belly full of nimble dumplings, I came back for one last sketch. But before I leave, you must know that with Dr. Montgomerie’s passing, his nutmeg plantation was auctioned off and eventually fragmented into building lots that were leased off to wealthy Chinese developers. Craig Road and nearby Duxton Road and Duxton Hill were constructed, which in the following years became the living quarters of the poor and depraved. This posh locale with ridiculously high rent and property prices that we see today emerged with constant development and urbanisation over the last fifty years. So, instead of rubbing shoulders with opium addicts and gamblers, I have a Korean tourist bending over my sketch and excitedly poking at the second building from left. Yes my good man, it is Hongdae Korean BBQ, now calm down, will you? 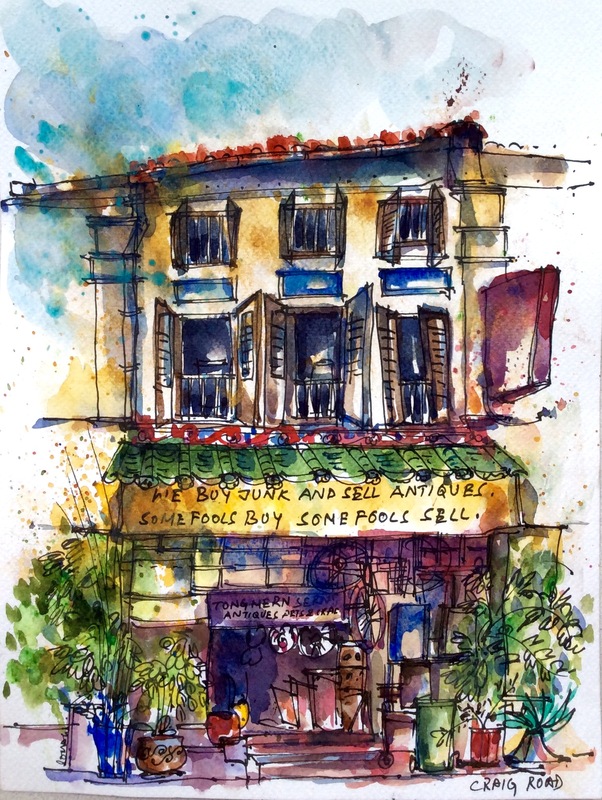 This entry was posted in Daily Vignettes and tagged architectural styles, Bar Ristorante, chinatown, Craig, Craig Road, Dr. Montgomerie, Duxton Hill, Duxton Road, Hongdae Korean BBQ, illustration, InItaly Bar Ristorante, Neil Road, nutmeg, Shophouses, Singapore, Tong Mern Sern Antiques Arts and Crafts Shop, urban sketching on May 8, 2015 by Somali Roy.